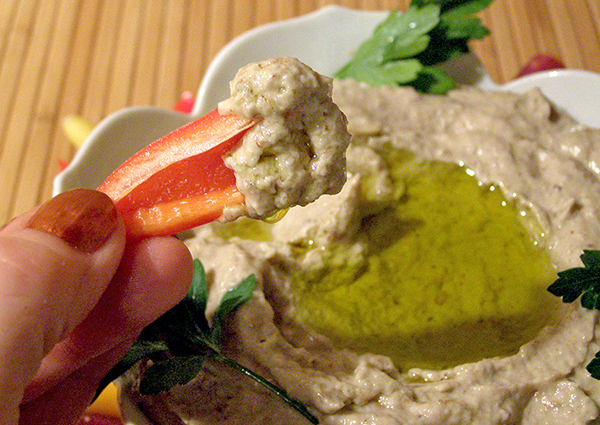 About 25 years ago, my friend Bee turned me on to Baba Ganoush, the Middle Eastern eggplant dip that he calls Eggplant Baba. He uses just grilled eggplant, cumin powder, cayenne, garlic, salt, and “lotsa olive oil.” Since I can’t recreate his delicious concoction of just 6 ingredients, I’ve added the traditional lemon juice, tahini, and white pepper. 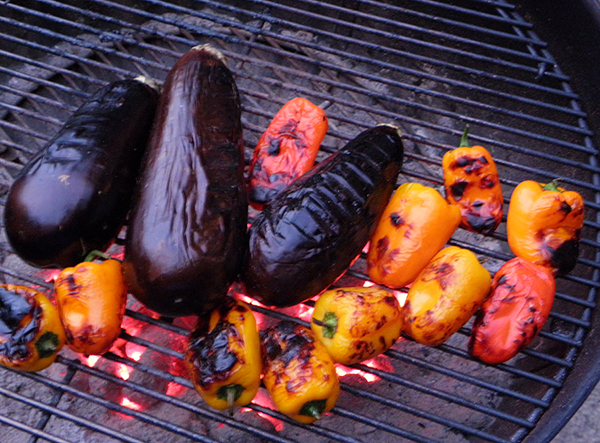 The key to authentic flavor is grilling the eggplant slowly till the skin is charred and insides are soft. I use a Weber grill for added charcoal flavor. Bee uses a hibachi, and also suggests grilling under a broiler or over a flame burner if it’s not barbecue weather. I use quite a bit of garlic, but mellow it out by sautéing it in a small amount of olive oil. Proportions of the basic ingredients can be altered as desired. A little ground coriander or other Middle Eastern spice can be added. 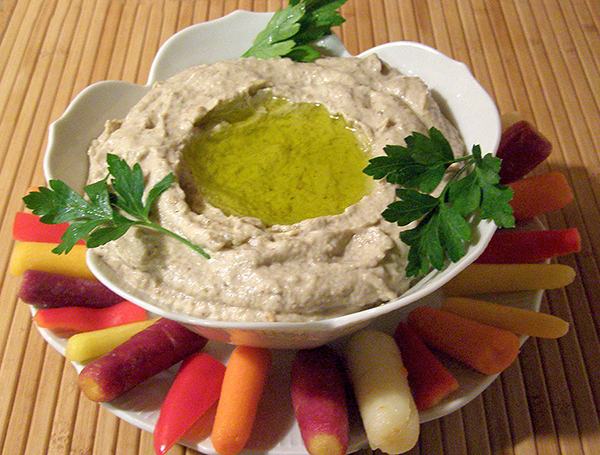 If you don’t have tahini on hand, try adding more olive oil and spices as Bee does. Some people mix in some chopped parsley, cilantro, or basil after the dip comes out of the food processor. Experiment with different sizes and types of eggplant. There are many Eggplant Baba variations, and they all taste great, so feel free to apply your own creative juices to the mixture. 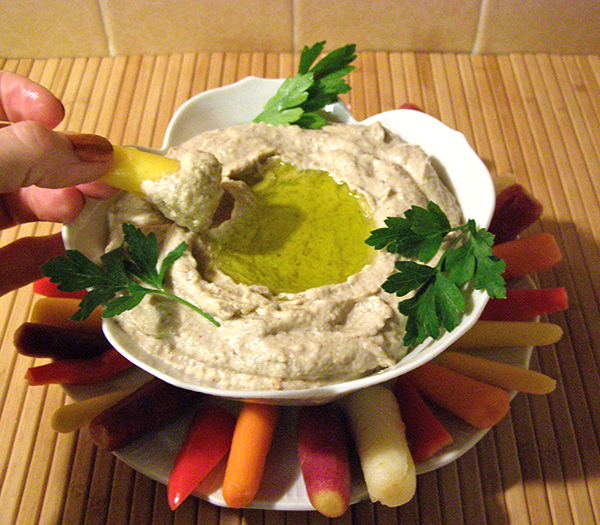 As far as what to dip, pita triangles are traditional. I like to dip a variety of raw veggies. Carrots and red bell peppers add a sweetness that compliments the earthy-lemony flavor of the baba. Celery, broccoli, and cauliflower are also good. Small crackers can be spread with the baba and topped with sliced olives or pimentos. 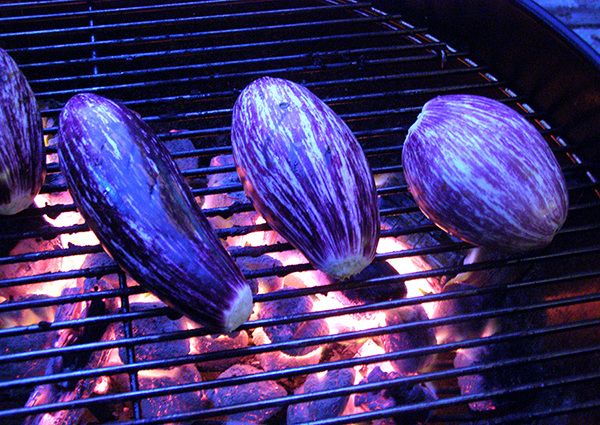 Grill the eggplant over medium-hot coals, at about 350 degrees, turning periodically, till completely charred on the outside and soft on the inside. Cool to room temperature. 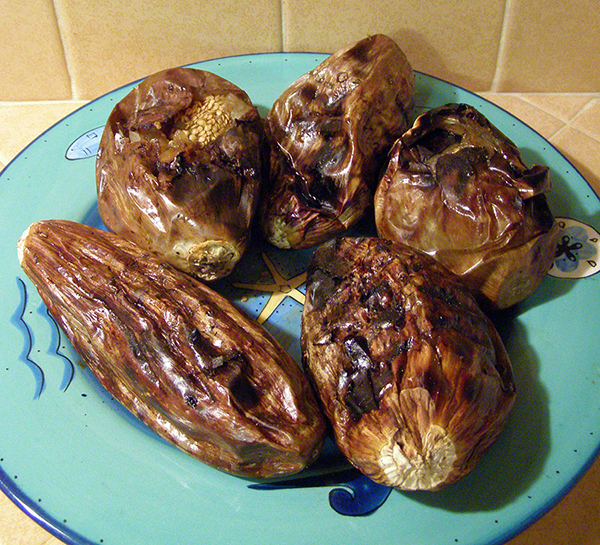 Peel off charred skin and/or scoop out eggplant insides into food processor. * You will have about 1½ - 1¾ cups of eggplant. Cut garlic cloves into 2 – 4 slices each. Sauté in 1 tbsp. olive oil over medium heat until softened and slightly golden. Add sautéed garlic and its oil to the eggplant in the food processor. Add lemon juice, tahini, cumin, salt, white pepper (if using), and cayenne to food processor. Process until whipped smooth. Check to make sure garlic is pulverized, and blend again if needed. Taste and adjust seasonings if needed (particularly the cayenne and possibly the salt or cumin). Blend in additional seasoning. If making dip, turn into serving bowl. Stir in a circular motion to make a well in the center. Fill well with 1 tbsp. olive oil. When enough things have been dipped to use up the pool of olive oil, make another well and fill again with 1 tbsp. olive oil. The following are good to dip: pita triangles, thin rice crackers, red, yellow, and orange bell pepper, broccoli, cauliflower, pea pods, carrots, and anything else you’re inspired to try. Green pepper, IMHO, overpowers the delicate flavor of the ganoush. If making spread rather than dip, scrape mixture from food processor into mixing bowl or other container. Stir in the 1 – 2 tbsp. olive oil (which is floated on the dip) before spreading on crackers, etc. 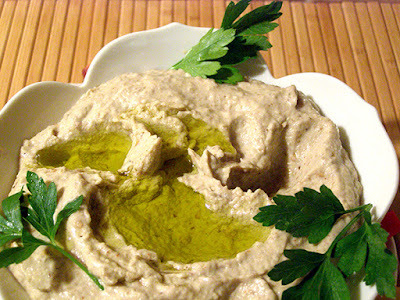 *You can also make baba ganoush without a food processor. Mash, grind, and whip up the eggplant by hand in a mixing bowl. Add the sautéed garlic and oil, mashing or cutting up the garlic slices well. Stir in lemon juice, tahini, and other seasonings and spices. Don't Judge the Outcome Yet! NOW You May Judge the Outcome!